A birdie blitz on the front-9 put defending champion Cameron Smith in position to better Jordan Zunic’s course record of 64 set 12 months earlier but it was a mature show of restraint that enabled him to shoot 7-under 65 and take a one stroke lead into the third round of the Australian PGA Championship at RACV Royal Pines Resort tomorrow. 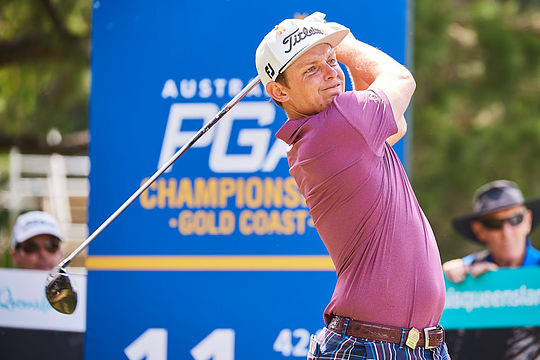 Smith’s former Queensland junior teammate Jake McLeod seemed destined to own sole possession of the lead at the halfway mark when he made a putt from six feet for eagle at the par-5 12th but a wayward tee shot on his penultimate hole that was deemed out of bounds saw him finish one shot behind Smith and level with Marc Leishman at 8-under par. Australian Open runner-up Dimitrios Papadatos is one shot further back in a tie for fourth along with round 1 co-leader Matt Jager and Queenslander Christopher Wood who made a late charge up the leaderboard with a superb 6-under 66 propelled by four birdies on the front-9 and three more on the back. International guests Harold Varner III and Andrew ‘Beef’ Johnston thrilled the large Gold Coast galleries with spectacular hole-outs at the par-4 8th and par-3 16th respectively, Johnston lifting the roof of the Volkswagen Marquee with his chip in from left of the 16th green. But while the overseas raiders and his World Cup teammate Leishman prepare to mount their charge, the current holder of the Joe Kirkwood Cup is the one best placed to triumph on Sunday. “I had no idea about the course record, to be honest. I was just trying to do my best,” Smith said. As Leishman, Papadatos, McLeod and Varner all found trouble on the easiest hole on the course by being aggressive, Smith tempered his hot hand early with judicious shot selection on his inward half. Refusing to be tempted by tucked pins on 13, 14 and 16 in particular, Smith avoided any disasters and displayed the type of course management that makes him a rising star in world golf. “I kind of got caught up in that yesterday with those last two holes,” Smith said of his bogey-bogey finish on Thursday. “It’s very easy when you’re playing good to go at the pins. They’re not that long a shot and you know you can hit them but if you miss it on the wrong side you’re absolutely done. Playing in the group behind Smith, Leishman could hear the roars in the early morning as the local favourite lit up Royal Pines but after successive rounds of 68 is confident his experience will count for plenty as the intensity rises. “A lot of golf to play and the course is only getting tougher,” Leishman said of his position through 36 holes. “It’s starting to speed up, which is good. The sun’s out, it’s warm, it’s only going to dry it even more.